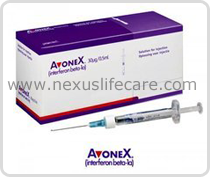 Uses:- Interferon Beta 1A Injection is used to treat multiple sclerosis (MS). Interferon Beta 1A Injection is not a cure for MS, but it may help to decrease the number of attacks of weakness and slow the progression of the disease. Side Effects:- Depressed mood, anxiety, trouble sleeping, restlessness, or thoughts of suicide or hurting yourself;easy bruising or bleeding, weakness; fever, chills, body aches, flu symptoms.